(Crux) ROME – For all intents and purposes they’ve been sworn enemies for five years, each in charge of one side of a bloody civil war that theoretically ended last year with a “revitalized” peace agreement – a deal that few observers believe will hold up for very long – installing one as president and the other vice-president of South Sudan. Yet on April 10-11, Salva Kiir Mayardit and Riek Machar Teny Dhurgon will be guests of the head of the Catholic Church and the Anglican Communion in the Vatican, where they’ll take part in an ecumenical retreat. For the 400,000 people who’ve died in the conflict, their handshake will come too late. But for Pope Francis and Archbishop Justin Welby of Canterbury, those deaths justify deploying every political and religious credibility to make this peace agreement stick, unlike over one dozen previous agreements. The two religious leaders will be hosting South Sudan’s political titans in Santa Marta, the residence within Vatican grounds Pope Francis has called home since the beginning of his pontificate. Beyond Kirr, who met the pope March 16, and Machar, the group will include three more of the five designated vice presidents: James Wani Igga; Taban Deng Gai; and Rebecca Nyandeng De Mabior. In 2013 Kirr accused Machar, his former deputy, of staging a coup, which led to the civil war. Eventually, Taban and Machar also fought each other. In September the two sides signed a power-sharing deal calling on the main rival factions to assemble, screen and train their respective forces and to unify them into a national army before the formation of a unity government next month. Representing the ecclesiastical authorities of the country, eight members of the South Sudan Council of Churches also will take part in the retreat. Pope Francis and Archbishop Welby have been planning an ecumenical trip to South Sudan for years, but the conflict so far has prevented it. Cardinal Pietro Parolin, the Vatican’s Secretary of State, recently told journalists that there’s “cautious optimism” about the pontiff visiting in the near future. “It will be a moment of spirituality and, above all, it will help make them aware of the responsibility that politicians and authorities have,” Cardinal Parolin said. Though neither Pope Francis nor Archbishop Welby will deliver meditations, both are expected to be on hand, and the pontiff will close the retreat with a speech. In 2016, the country’s top Christian leaders paid a visit to Pope Francis, urging him to return the favor. The South Sudanese leaders in question were Archbishop Paulino Lukudu Loro, of Juba; Reverend Daniel Deng Bul Yak, Archbishop of the Province of the Episcopal Church of South Sudan and Sudan; and Reverend Peter Gai Lual Marrow, Moderator of the Presbyterian Church of South Sudan. The Vatican hasn’t released the name of the eight religious leaders who will take part in this week’s retreat, but there’s no reason to believe these three won’t attend. 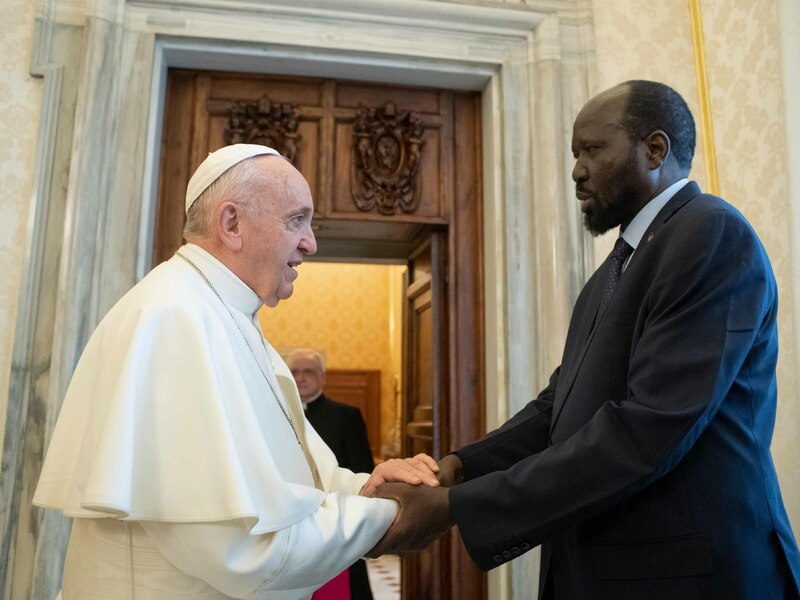 Loro told journalists at the time that Pope Francis could help South Sudan because “we are a God-fearing nation” and people respect his leadership. South Sudan is one of the world’s youngest countries, as it became independent from Sudan in 2008 after decades of civil war. The new internal conflict from 2013 to late 2018 was often labeled as a “forgotten war,” rarely spoken about in the media, yet the death toll puts it among the bloodiest of the early XXI century. The conflict was fueled by hate speech and incitement to violence against ethnic groups, with the United Nations declaring in 2016 that government forces and rebels had committed ethnically targeted rapes and killings of civilians during clashes. Unity among religious leaders is considered key, including Christians working together to address the problems, consulting each other and suggesting a solution based on dialogue and consultation. It took three years, but said meeting is finally happening, in Rome.